Item # 312955 Stash Points: 6,995 (?) This is the number of points you get in The Zumiez Stash for purchasing this item. Stash points are redeemable for exclusive rewards only available to Zumiez Stash members. To redeem your points check out the rewards catalog on thestash.zumiez.com. 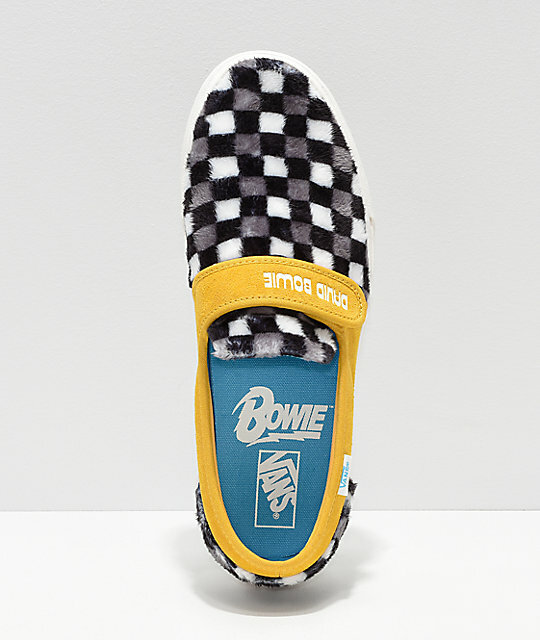 Celebrate a legend and one of the best albums of all time, in the Slip-On 47 V Hunky Dory Skate Shoes from Vans and David Bowie. 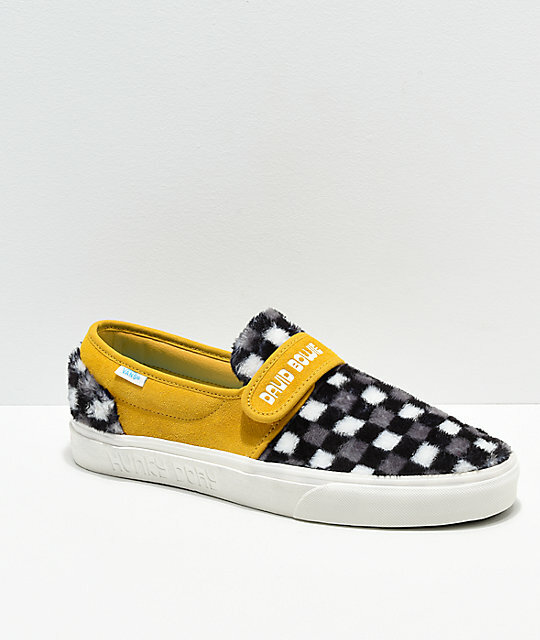 Part of the Vans and David Bowie Archive collection, the Slip-On 47 V Hunky Dory Skate Shoes feature black, grey, and white checkered faux-fur panels at the vamp and heel, matching the fur jacket that Bowie wears on his 1971 album, "Hunky Dory." 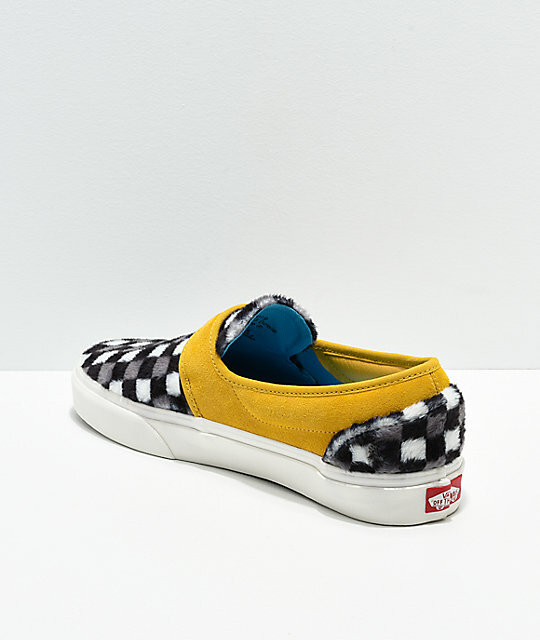 Yellow-gold suede panels are added to the collar and sidewall, along with hook and loop fastened straps, for a pop of color. The design is complete with David's name embossed on the top strap, and Hunky Dory embossed at the outsole, for a look that pays homage to a great musical talent. 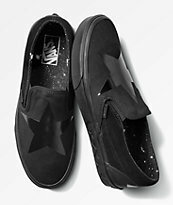 Slip-On 47 V Hunky Dory Skate Shoes from Vans x David Bowie. 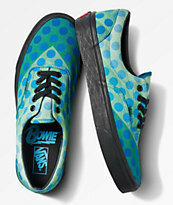 Part of the Vans & David Bowie Archive collection. Black, grey & white checkered faux-fur vamp and heel panels. Yellow suede collar with embossed David Bowie detailing. "Hunky Dory" embossed on outsole. 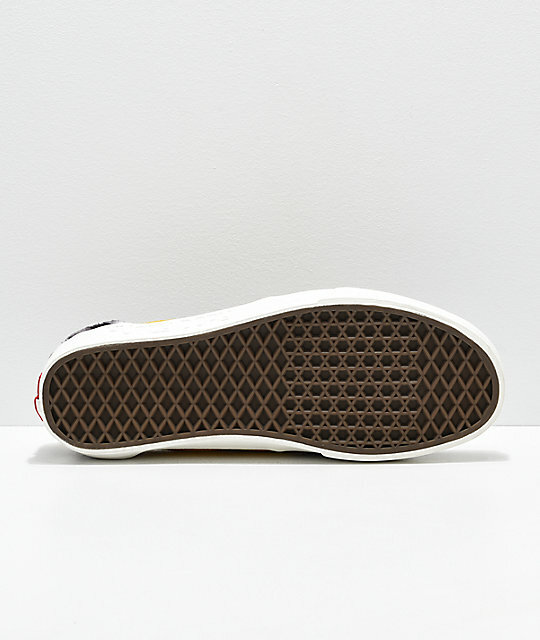 Vulcanized outsole for flexibility and boardfeel. 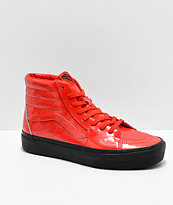 Vans rubber stamp at the back.